The GPE Board of Directors is currently meeting in Addis Ababa, Ethiopia. Shiferaw Shigutie, the Ethiopian Minister of Education spoke at the opening session of the Board meeting highlighting the remarkable progress Ethiopia has made over the past decade in achieving the Millennium Development Goal of universal education and the fruitful collaboration with the Global Partnership. 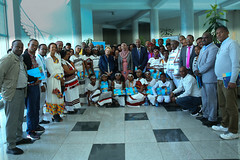 Following the walk, officials from the Ministry of Education, UNICEF, UNESCO and other partners reviewed progress on girls’ education in Ethiopia. The panel highlighted the challenges on girls’ education and proposed suggestions for improving access, retention and achievement of girls through primary, secondary and tertiary education. Furthermore, some strategies for retaining girls in school such as peer support programmes, additional teacher support as well as linkages among girls at primary with those in secondary, among secondary with those in tertiary were shared. If you are able to read this sentence, you are one of the few fortunate individuals who have had a basic level of education. Unfortunately for a majority of young girls in developing nations, having the ability to read is a privilege they are not able to enjoy. Education for women is perceived more as a privilege than a necessity. Currently throughout the world, Southeast Asia and Sub-Saharan Africa are known to have the highest rates of illiteracy, including 62 per cent of women in Africa, and 71 per cent in Southern Asia (UNESCO). These statistics can be traced to a variety of cultural and socio-economic factors in states where women are not deemed fit to explore career opportunities or basic education. This is often due to preset standards of a woman’s role within the home. Even though gender equality is on the table for the Post-2015 discussions, girls per se have little space in the discourse. In particular, girls’ education, acknowledged as the foundational basis not only for gender equality, but for a number of development outcomes is receiving limited and diluted attention. Today October 11, 2013 International Day of the Girl Child is celebrated by UNICEF. 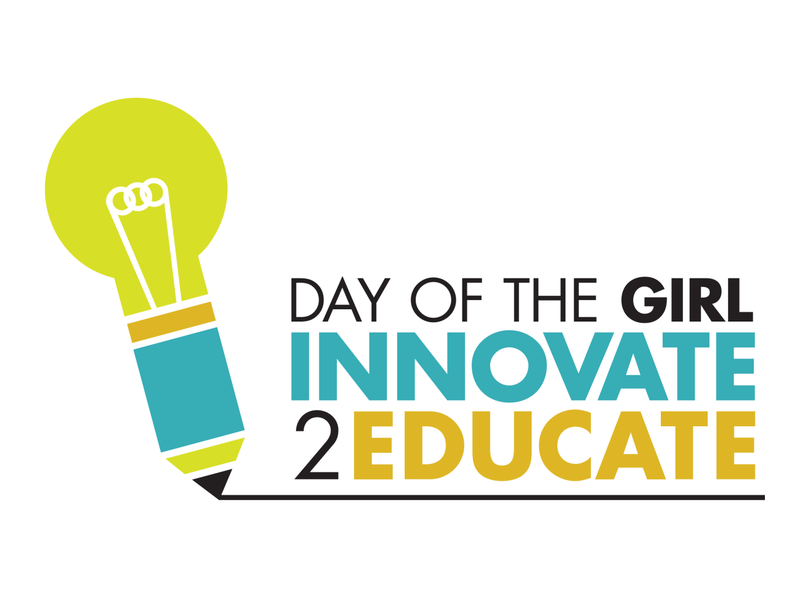 As the lead organization for the day, UNICEF selected the theme “Innovating for Girls’ Education”, in recognition of the need for new, creative solutions to this very old challenge. We want to highlight the many different shapes innovation can take – technology is but one. This event provides an opportunity for global leaders from the UN, civil society and the private sector to hear girls’ voices and their innovative potential, and respond on how these can be reflected in the Post 2015 agenda, especially with regard to girls’ education. 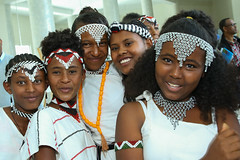 UNICEF Ethiopia Goodwill Ambassador, Hannah Godefa, will be speaking during the event at HQ. Fifteen year old Hannah involved in humanitarian activities when she visited her native land, Ethiopia, for the first time. Coming from Canada, Hannah got her inspiration when she interacted with local girls from the countryside who lack access to basic education materials. ”Even though I was happy to see my extended family, I was also very sad to see children my age that do not get much food, medicine, quality education and orphaned due to HIV and AIDS.” said Hannah. 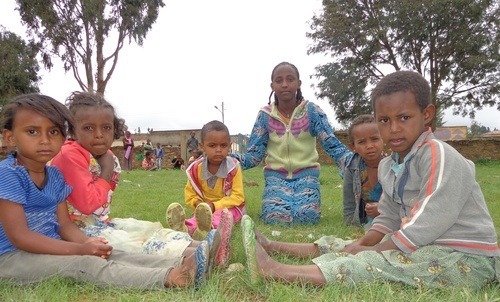 16 September 2013: The Ministry of Education of the Federal Democratic Republic of Ethiopiatoday launched a massive nationwide awareness campaign on going back to school and called on parents, communities and local leaders to bring their children to school. The awareness campaign, which is being kick-started this week, as schools open across the country, is a drive that seeks to increase awareness of parents on the importance of education and support Ethiopia to meet its Millennium Development Goals on universal access. 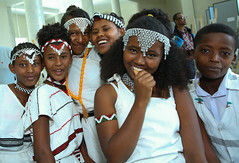 Ethiopia has steadily increased the number of children in school in the last two decades from as low as 2 million in the 1990’s to over 22 million in 2012, trebling its Gross Enrollment Rates from as low as 32 per cent in 1990s to 95 in 2012. With the current Net Enrollment Rate of 86 %, Ethiopia is on track to meet MDG 2. However, current data from the just completed Study on the Situation of Out of School Children in Ethiopia shows that 3 million children remain out of school, while enrollment rates reveal marked regional disparities with regions like Afar recording enrollments as low as 32%. Key barriers in the way of the country’s drive towards access to universal primary education include costs around schooling, lack of basic facilities and quality education. These are often compounded by negative and harmful traditional practices, like early marriage and the preference for boys over girls, which put education out of reach for many girls. The media campaign seeks to mobilize communities, national leaders and international development partners to bring and keep Ethiopia’s children in school.